Magento 2 Pre-Order extension allows ordering products which are out of stock or upcoming in advance. When some products in your store are completely out of stock or not available, your customers might be able to pre-order these products with the help of Magento 2 Pre Order Extension. If customers want to buy products that are temporarily out of stock or coming soon, they can get these products as soon as they are available by creating a previous order. 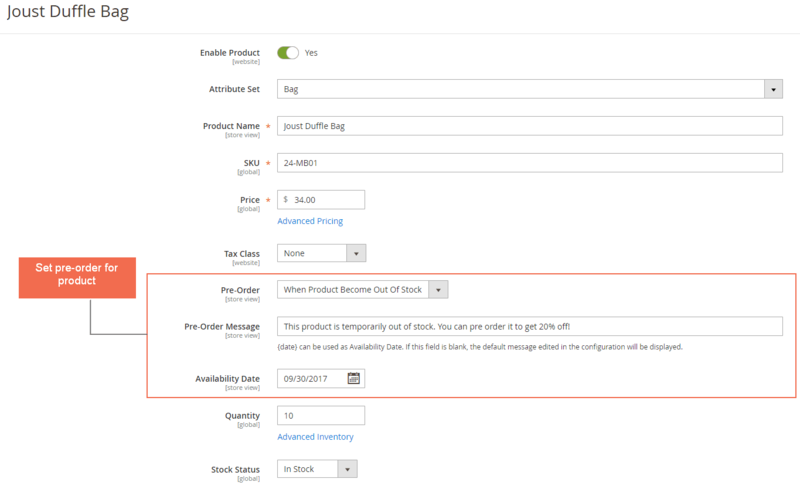 In the product pages of pre-order items, the Add to Cart button is replaced by Pre-Order button and the availability date is displayed in the stock status field. Purchasers can create orders with pre-order products like other normal orders. Labels or messages for pre-order products are displayed on the product page and shopping cart to notify buyers. Besides, registered customers also can check pre-order items on the order details page (Go to My Account → My Orders → View Order). Magento 2 Pre Order Extension allows admin to setup pre-order function for each simple product and individual item of a configurable product or a grouped product. You can set a product always as pre-order or set it to become a pre-order item when it is out of stock. Choose to permit your customers to add both pre-order and regular items to an order or not. Store owners need to let customers know that why this product is a pre-order item and all information about the pre-order products. This module allows creating a message for each or all pre-order products. Magento 2 Pre Order extension also helps you show a warning message in shopping cart and order information page if the order contains pre-order items. In the order grid table, the pre-orders’ status will be “Pre-Order Pending” or “Pre-Order Processing”. Admins can promptly find out the pre-orders by sorting filter. In case the order has not included pre-order products, admin can change this order status to manage all orders easily. Why is Pre Order for Magento 2 a Must-Have Extension? Some products on your website are temporarily out of stock or are going to be released soon and your customers have much desire for buying these products at present, what will you do in this situation? Creating pre-order function for these products is the most suitable solution. You will not miss a lot of potential customers and increase your sales without affecting profit. You can create a discount campaign for pre-order products to attract customers and give them the more added value of these products. A pre-order campaign will help your store have competitive advantages over your rivals. I bought this extension nearly one month ago and I'm really happy with the results. Using this tool, I can launch the pre-purchase program and earn many benefits from this. I found out this extension last month but at that time, it hasn't released yet. I read the content on the page and this pre-order extension seemed very functional so I joined the pre purchase program of your site. Your support team sent me a notification email as soon as the module has been available. After an easy installation process, I can create pre-order function for products on my store without difficulties and it works very well as I expected.